Ziauddin Yousafzai is best known as the man who refused to clip his daughter Malala’s wings and instead stood beside her in defiance of the Taliban. But he’s equally proud of his other roles — as a husband, father of three, educator, co-founder of Malala Fund and as of today, author. 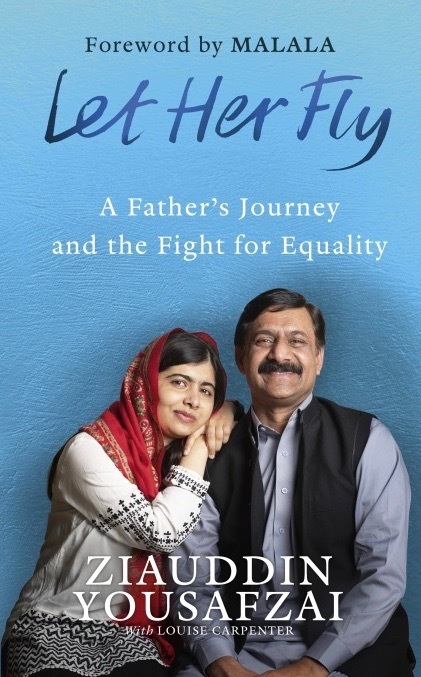 In his newly published memoir “Let Her Fly: A Father’s Journey and Fight for Equality” Ziauddin explains how his education enabled him to unlearn the patriarchal beliefs he grew up with and become the courageous activist and exemplary father we know him to be. Earlier this week, Ziauddin spoke about the stories in his book about his childhood, early activism and the lessons he hopes to share with readers. “Let Her Fly” is available for purchase in the U.K. and is available for pre-order in the U.S. (on sale November 13, 2018). Ziauddin: I realised very early in my childhood that I was different from my five sisters because of my gender — in everything I did I could feel my parents treat me as more important. At breakfast I was given milk with tea, but my sisters didn’t have the same privilege. I had more sets of clothes and many more pairs of shoes than my sisters. The most obvious difference, I was going to school and they were not. The only reason for all of this, was that I was a boy. They might have visited a boys school for two or three days, but there was no proper schooling for girls. It wasn’t something girls thought to ask for or saw as important because they were brought up in a way that they never thought of school as a basic right or possibility. To be honest, it took a long time to start. When I was a teenager I saw girls not treated well, not being sent to school, their views and opinions weren’t valued — I started to wonder why it was this way and not a different way. After my first cousin was bound in a forced marriage and I could see how she suffered because of it, I decided to change. I wrote a poem called “The Promise” where I said I would stand by girls and women. It said they are worth more than giving birth and raising children, that no one should enchain them. These were my early commitments and I guess acts of feminism — though I didn’t know what that word was until I came to the U.K. In the beginning it was hard to face the criticism. When you stand for change, especially when it’s against your own community's social taboos, you have to overcome your own fear — the first person that comes across you is you. But I was stubborn. I ignored the criticism, self-doubt and stood up to it. I did what I believed in. When Malala was 11 or 12 I got invited to speak at a rally because of my activism, but they introduced me to the podium as “Ziauddin Yousafzai, Malala’s father”. It was very unusual because children are known by their parents. When Malala became my introduction it was a big achievement. And my boys also make me proud. They have the mindset, heart and soul to believe in equality and justice. They are caring and respectful to other religions and ethnicities. I’m a very lucky father. Each of my children have good qualities, unique talents and potential. Parents in many communities are usually the teachers, but for me parenthood is different. It is a modern, shared learning. I learn from them and everyday they teach me something new. For example, from Malala I find her strength of character, resilience and empathy inspiring. I wish to be like her. Even in times like I’m talking to you know, I wish I could speak short, to the point and precise like Malala. I try and sometimes ask her advice on this, but other times I forget. The thread that runs through my transformation is education — how a boy from patriarchy can become the man I am now who believes in equality. Also it tells the story of how change can begin with you and your family. I hope people who read this book will enjoy it and learn from my journey as a son, brother to my five sisters, a husband to Toor Pekai, father to my two sons and daughter, and as a teacher of hundreds of students. Note: This interview was edited and condensed for clarity.